St Patrick’s Day marks the official day of the patron saint who brought Christianity to Ireland, yet, it is better known as the day to drink copious amounts of alcohol and celebrate Irish culture. While most countries outside Ireland and Northern Ireland do not recognise the holiday officially, you can celebrate the festivities by joining a mass of drinkers wearing grotesquely large Guinness branded hats in the many Irish bars across the globe. Irish settlers in Britain, Canada, the United States, Argentina, Australia and New Zealand claim to be the biggest St. Patricks day drinkers outside the Emerald Isle. Aside from drinking, celebrations include parades, going to church, attending a céilidh (a traditional Gaelic gathering involving folk-music and dance), wearing green or orange (even though the traditional colour is blue), and wearing shamrocks. Most people will stick with tradition and drink Guinness throughout the day and perhaps a few Irish whiskeys. If you don’t like the heavy taste of Guinness nor the fierce burn of whiskey, you could order a baby Guinness, a shot of Kahlua and Bailey’s. Let’s see where our very international Just Landed Team have celebrated this auspicious day. After living there for several months I was surprised to find Tokyo is home to the largest St. Patrick’s Day parade in Asia. In fact, Tokyo gets so into the Irish festivities, the iconic Tokyo Tower is illuminated with green lights for the occasion. So excited was I for a taste of something from home (or at least near home), I took the afternoon off work for the parade. 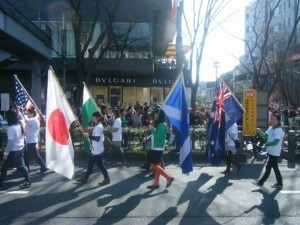 Pipers, dancers and Irish expats trooped down Omotesando, one of Tokyo’s major boulevards. There was even a group of Irish setters dressed in dog-sized green hats and jackets. Once the parade had passed, in St. Patrick’s day tradition we all headed to a nearby Irish bar to partake of the black stuff. The parade spirit wasn’t dampened by the drizzly weather, perhaps Ireland was sending some of its infamous weather over for the occasion! All nationalities were represented in the procession, from Australian to French, and of course many Japanese. One thing’s for sure, though St Patrick died over 1,500 years ago, he is doing a good job of bringing people together today. Going out in Cambodia’s bustling capital on any evening was an interesting experience: overloaded moto-taxis and tuk-tuks careening round the streets; street vendors, markets, and the overripe smell of the river flowing by the tourist hotspot of Sisowath Quay. On the night of the most international excuse for excessive merriment, Phnom Penh’s expat districts are suddenly overtaken by an emerald mass as the city’s expat community digs out their best green, white and orange clothing and heads for any bar promising Irish stew, Guiness and Jameson’s. It was strange to see in a nation that is so climatically unfriendly to those of a celtic complexion, and it does show how thin the pretense to celebrate is, but I’ll admit it’s entertaining to see the enterprising spirit of the local-run Irish bars of Phnom Penh; who’ll see to it that any barang (foreigner) leaves full of food, happy, drunk and clutching the back of the poor fellow tasked with getting them home on his ancient Honda. I’ve had the chance to attend St Patrick’s festival in Dublin. The event takes place over several days and includes a parade, family events, live music, and the part that I enjoy the most, a céilidh: where hundreds of people gather for traditional Irish folk dancing in the streets, be it sunny or rainy! 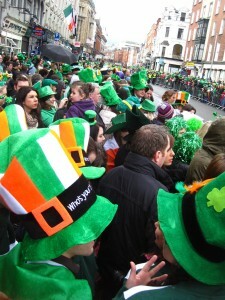 The parade, which goes through the main streets of the city, is attended by thousands of people, dressed in green, wearing funny hats and face paint. Pubs are then taken over for the rest of the day and serve mainly Guinness to crowds singing Irish songs, an occasion for all to party as the Irish know best! 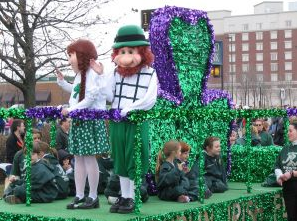 Do you have an expat St Patrick’s Day tale to tell? Let us know in the comments below. Next story Expat guide to Chile, now in Spanish! Previous story Do you study or work?